After a week of awful weather, Sarah and Adam were blessed with a gorgeous Bank Holiday for their wedding! The car thermometer read 23 deg when I travelled from the Euxton Methodist Church to Charnock Farm which was half way between Chorley and Leyland. What a fabulous day it was too! Sarah got ready at her parents house and wore a stunning gown with a shoulder covery thingy which was just lovely! Interestingly their flowergirl led the walk down the split aisles in the church sprinkling petals as she went and really didn't rush but played her role marvellously! So much so in fact the rather talented organist had to improvise a little to keep the music going until Sarah got to the bottom to meet Adam. 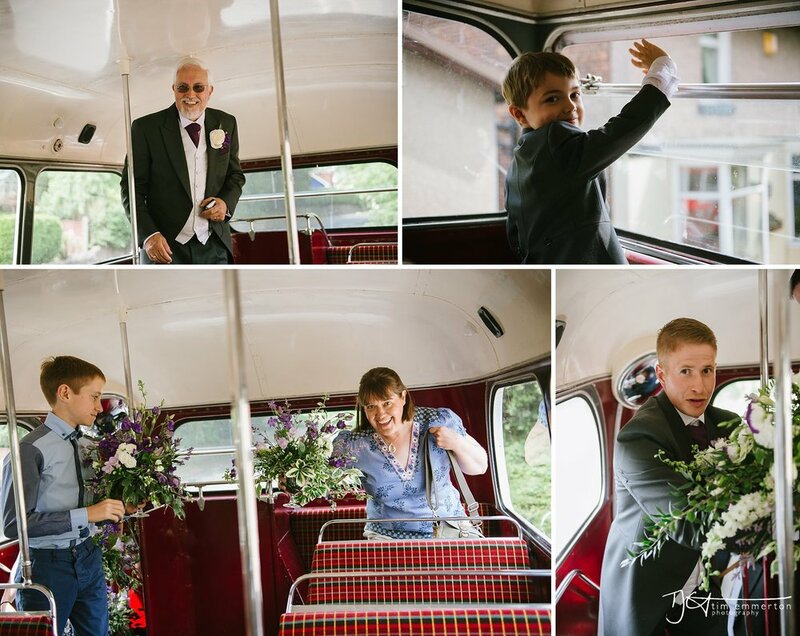 The church was packed to capacity and after a lovely ceremony guests were transported in an old London Bus to Charnock Farm for the wedding reception.